People love their chain restaurants. 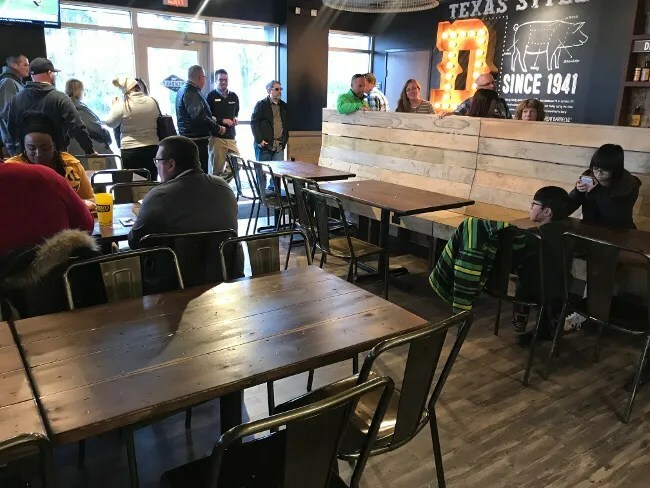 I’m never surprised when a new chain restaurant opens in Kalamazoo and the lines are out the door for the first few weeks. I’m not gonna be one of those people that turns my nose up at those people though. I’m usually itching to try the new place myself. 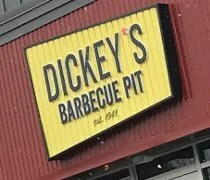 The newest chain restaurant to set up shop in Kalamazoo is Dickey’s Barbecue Pit. It’s the first business to open in the new The Shops at Stadium Village where Gallagher’s Pub used to be. 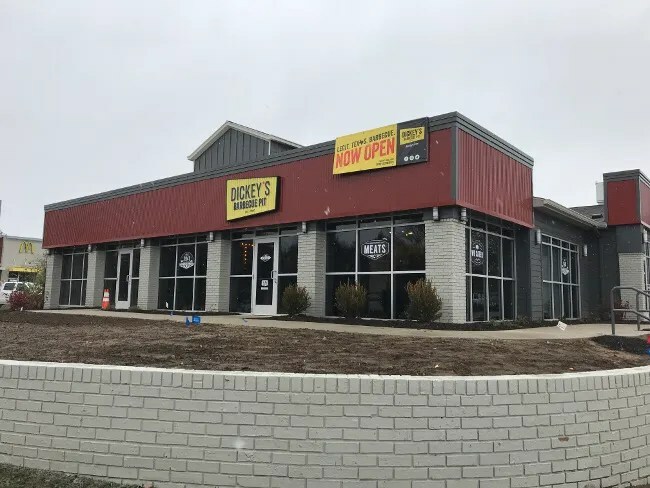 Dickey’s Barbecue Pit already has 13 locations in Michigan. Most are in the Southeast corner of the state but there is one in Coldwater that we stopped at on our way home from Columbus, OH a few years ago. We really enjoyed our meal that night so we were really excited when we saw Dickey’s coming to Kalamazoo. I pulled in to the parking lot just after 1:00 on Friday and it was packed. There was only one spot open. Good thing I put my order in online and was just stopping in to pick it up. 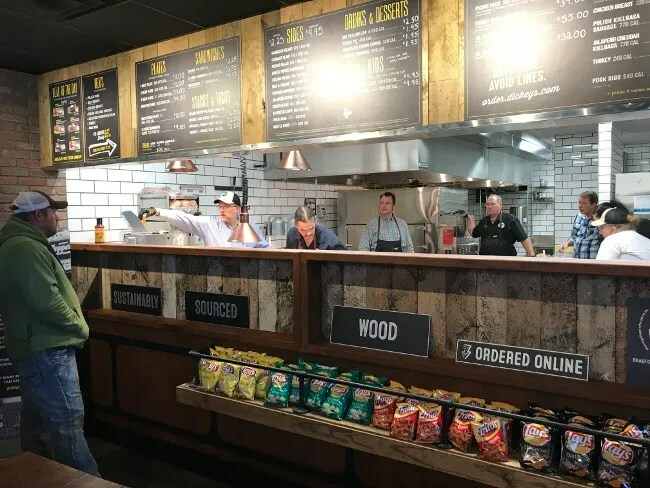 Dickey’s Barbecue Pit is a fast casual concept with ordering done at an order counter and put together right in front of you as you make your way down to the cash register. The dining room tries to create the feeling of a Southern BBQ road house. The floors are wood laminate and the walls are covered with a faux brick wall. The space makes heavy use of wood slats to for benches and walls within the space. As I mentioned, I had put in an order online so I went right to the cashier when I walked in. I gave her my name expecting to be handed a bag of food, but it still took another ten minutes as they seemed to put it together after I walked in. They were very busy but going by the order tracker online, my order should have been waiting for me. I grabbed the two bags of food and filled up our Big Yellow Cups with a Coke and Sweet Tea I also got enough of the sweet BBQ sauce for J and I to split. 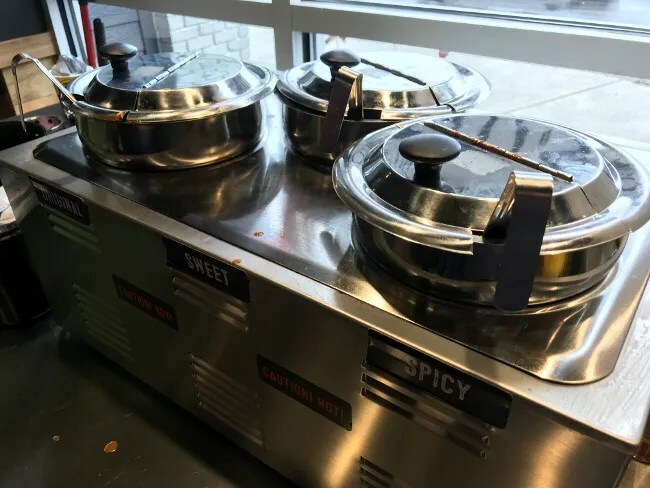 Instead of bottles, there are soup pots full of their three BBQ sauces. I then headed home to eat. We had some of the neighbor kids over because KPS had a half day and their mom has a late class on Friday. I ordered enough Mac & Cheese to feed all four kids instead of ordering off the kid’s menu. 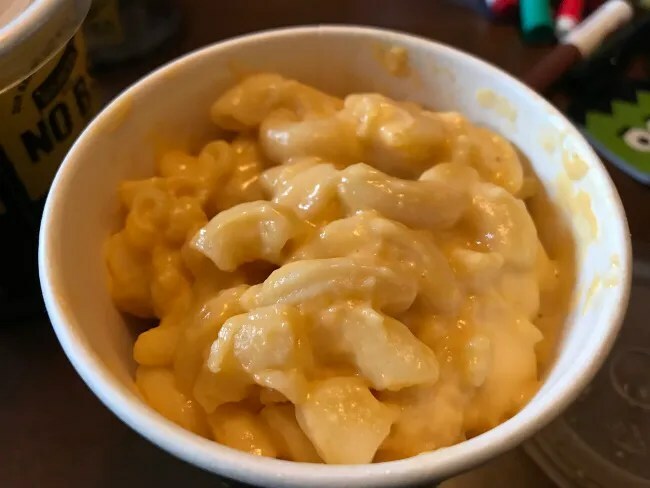 The Mac & Cheese is so thick and creamy. The pasta is large macaroni noodles with a dense cheddar cheese sauce. Three of the four kids (B being the outcast here) ate all that we put on their plate and asked for more. I ordered a sandwich instead of just getting meat. I picked The Westerner. This sandwich is a hoagie roll filled with a choice of two meats. I picked the brisket and the pulled pork. It’s then finished off with a couple slices of cheddar cheese. 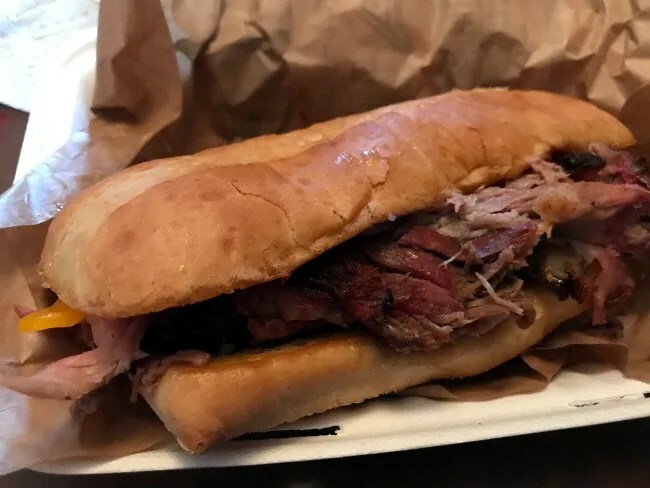 There was definitely more of the cheaper meat on this sandwich (pulled pork) but the little bit of brisket there added a nice salty addition to the sandwich. I didn’t sauce directly on the sandwich but instead just kind of dipped it to get a little bit of sauce on the bread. 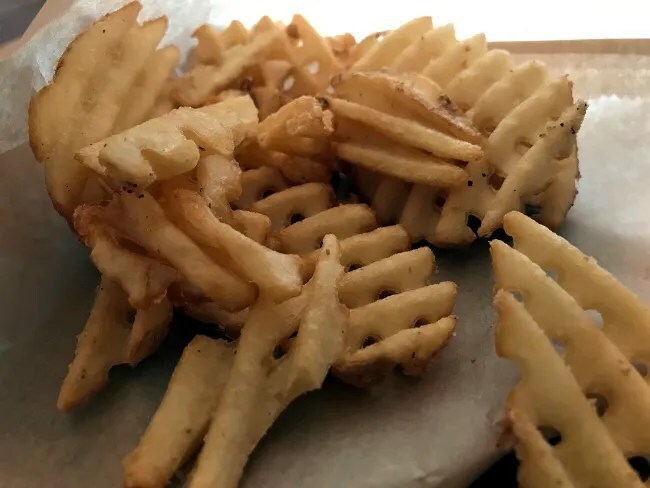 I also ordered a medium order of waffle fries as a side. I really didn’t need to do that. They gave me two small bags and one bag would have been plenty. I used the fries to get some of that delicious BBQ sauce. Instead of ketchup, I dipped my fries in the leftover sauce and it was glorious. The sauce is a little sweet and slightly spicy. I really enjoyed it this way. I don’t always like sauce on my meats but I love it with fries or mac & cheese. J ordered the Pulled Pork Classic Sandwich. As the name implies, this is a simple sandwich of pulled pork on a brioche bun. She opted to add slaw and cheddar cheese on top of the meat and they sure added a lot of it. 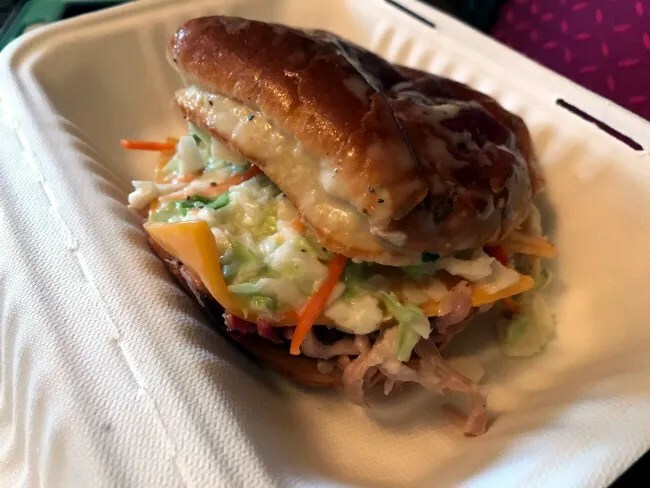 The slaw is a mayo based slaw that oozed out of the side of the bun. J likes it that way though so no complaints. She really enjoyed the sandwich. Our bill for lunch was right around $40. There are so many great BBQ places in Kalamazoo right now which I still laugh at. Eight years ago I was complaining about the lack of any decent BBQ in town now I have so many choices I could eat at one every night of the week. Dickey’s main advantage will be it’s proximity to home and the large portion sizes. Our kids like the mac & cheese which gives them an advantage with us as well. The BBQ is really good and because it’s a chain, it’s always pretty consistent.